A couple of weeks ago, in Rome, the Social Media Week took place. I had been following them for a while and this year I suggested a panel on the Internet of Things in the vineyard, a topic I’m very interested in. I decided to ask Marco Caprai, who’s been working with IoT in the vineyards for a while, and Sergio Bucci of Vignaioli del Morellino di Scansano whose project I know well, for known reasons, to present their experience. My task was to introduce the topic. Consumers often imagine agriculture, and viticulture too, as something picturescque. Or if you live in the countryside, you can associate a tractor with a long queue, just like when you’re in Rome on a Friday afteroon. In fact, these days tractor cabins look more like the cabin of an airplane than we’d think. Tractors can even drive “by themselves”, by setting the GPS. In other words, technological innovation is making huge steps ahead and while in the past innovation was mostly aimed at mechanizing agriculture, so as to reduce costs, these days the goal is more often that of environmental sustainability. Or, better still, innovation focuses on reducing costs but having environmental sustainability in mind. Indeed innovation can be even more interesting given the climate changes we all have under our eyes. What if the Internet of Things helped us in a better management of climate changes? Let’s take a step back, and start from a definition of the Internet of Things. When we speak of this, we refer to the possibility of connecting different objects thanks to an Internet network through which they can exchange data. What objects? Well, the most emblematic ones are drones. Perhaps because they look nicer in pictures than a sensor on a vine. In general, in viticulture, sensors can create the greatest opportunities right now. Their price has decreased significantly and thanks to Arduino boards we can use the date collected by the sensors and connect the sensors. So Internet of Things in the vineyard refers to sensors that measure temperature and humidity, atmospheric pressure, temperature of the soil, leave humidity, sun intensity and so on. The action based on these data make the so called precision agriculture. in distribution – to allow a better storehouse and provisions management through NFC or RFID techology, or with rechargeable smart bottles; one might wonder if in the future Amazon will implement a Dash button to freshen up your cellar with just one click. 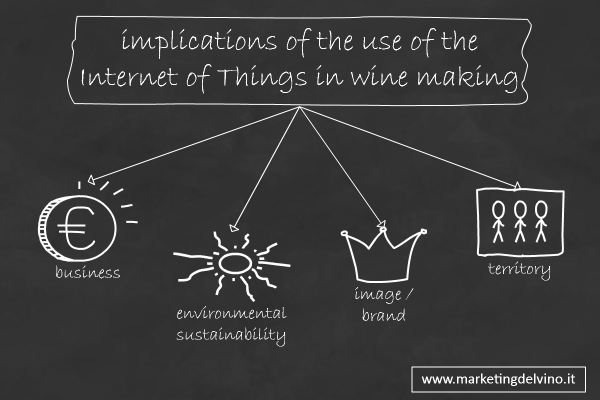 How does the Internet of Things work in the Vineyard? data is collected from the vineyard, the line and the vine through sensors. Data is then matched with data connected with drones, or with weather forecasts, or, in time, with archived data and actions taken in the past and their results. In this way you can give an input to the person managing the machinery so as to treat the vines at a specific time and just in one specific place – this is why we call it precision agriculture. Territory: now, when speaking of territory, in the wine and food industry, I like to include in this concept not just the landscape, but the people who live in this area and the traditions and products that characterise it too. For sure, the IoT has an impact on the territory too – by reducing the environmental impact and the use of chemical there’s a positive impact on the families living in the area, you change local traditions, perhaps and create the opportunity to interact with universities – more or less local – or promote special training centres where young students will acquire the necessary skills. Finally, here’s an article on what they’re doing at Vignaioli del Morellino di Scansano since last year. Here instead you can find a video by Arnaldo Caprai in which they explain what they’re doing there. And here’s a story by Luciana Squadrilli (in Italian) on the same event.